Is the KEL TEC SUB-2000 Legal in California? KEL-TEC SUB-2000 M-SERIES California Compliant Option is Now Available! The KEL TEC SUB-2000 is a highly sought after rifle. Its sleek design and adaptable features make it one of the most popular firearms today. Many people in the great state of California would love to have one of these rifles. But if you live in California, there are some hoops that you are going to have to jump through to own one. Today we are going to discuss how to make your KEL TEC SUB-2000 California legal. KEL TEC SUB-2000 "California Legal"
Many of you might be wondering if owning a KEL TEC SUB-2000 in California is legal. The answer is yes and no. A stock SUB-2000 that comes directly from the manufacturer is not allowed in the state. But with a few modifications, the rifle can be owned without the worry of getting into trouble with law enforcement. Most Out of State Gun Dealers have a California compliant option or are willing to make it compliant for you before "importing" it to California. After reading this report find an Out of State dealer that is willing to make the necessary modifications for you and ship it to your California FFL. Now let’s talk about how to make the KEL TEC SUB-2000 California compliant. In order to make this beautifully designed rifle compliant with the strict gun laws in California, you will need to change several things. The gun laws in California are difficult to understand. But today we hope to make them a little less scary for those who are looking to modify a KEL TEC SUB-2000. First, the law states that no detachable magazines are allowed on rifles. Second, the law states that rifles must have a barrel length of over 16 inches and the overall length of the rifle needs to be 30 inches or greater. Also, no rifle should have a pistol style grip. But luckily, there are ways to comply with each of these rules. Below we will take a deeper look into these modifications. The overall length needs to be 30 inches: This can be accomplished by adding a stock extension or installing a recoil pad that is over ½ inches in length. This is fairly easy to do but there are some stipulations that come with this modification. The rifle's overall length is measured with the stock in the shortest collapsable configuration. You also have the option of adding a compensator to the muzzle to add some extra length but be careful you can't legally add a flash suppressor. Some of the newer Gen 2 KEL TEC SUB-2000 rifles already come with an overall length of 30 inches, so check with your gun dealer for the "California Variation". ***Update*** Bullet Buttons will no longer be compliant with new CA legislation. A magazine release block like the AR Mag Lock that blocks the mag release unless the action is opened first. If the SUB-2000 had this feature than it would no longer be classified as an assault weapon under California law, with all the attendant annoyances removed (no Kydex flap on the pistol grip, no registration come January 1, 2018, can still have a flash suppressor and a forward pistol grip, can still have an adjustable stock.) Just can't drop a mag and pop in a new one as quickly. Since the SUB-2000 can fold really quickly with the pull of the trigger guard a New SUB 2000 Mag Block Lock is in order. Otherwise, unless you have a fixed magazine, six items are prohibited, making the SUB "featureless. According to CA Law a firearm that has a fixed magazine that cannot be removed without opening the action, in is not an assault weapon. That's why the mag release locks are so important. Take a look at the exact legislation that controls this, Senate Bill 880, which added section 30515(a) to the Penal Code. The new section is 35015(a)(1) that adds a new definition of an assault weapon. Below is a picture of the SUB-2000 with a Bullet Button which no longer complies with CA Laws because the magazine can be removed with the use of a special tool that by passes the bullet button. Now the new law requires a complete blockage of the mag release. Old bullet buttons will no longer work. The SUB 2000 needs an AR Mag Block Lock style feature to be compliant. Let us know if you want us to come up with one. KEL TEC SUB-2000 Mag Block Lock now replaces the Bullet Button. A Mag Block Lock will need to be added to the rifle. Now things get a little more complicated. No longer will the bullet button make you compliant with California Assault Weapon Regulations. While some of you may have heard of a bullet button before, others are probably scratching their heads. Basically, a bullet button will lock a detachable magazine into place. It can only be removed with a special tool. With this modification, the magazine release will be replaced with a block that forces the user to utilize the tool instead of his or her fingers. This used to make the gun compliant to the California law against detachable magazines. Now the new Law takes it a step further to require a completely fixed magazine until action is disassembled. 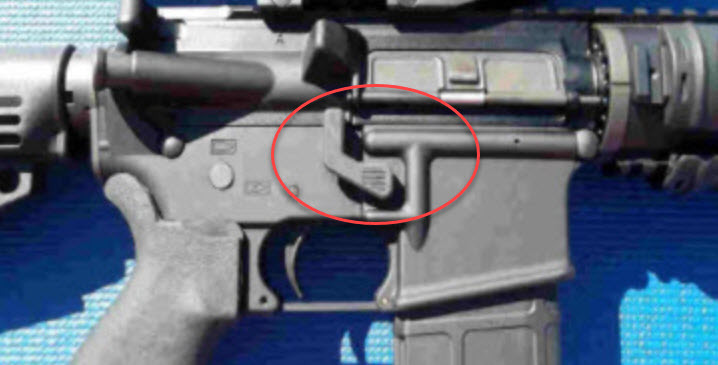 With a Mag Block Lock installed the firearm is considered to have a "fixed magazine" according to California Law. Although a inconvenience, the Mag Block Lock will allow you to have many of the so called “evil features” that are not allowed by law combined with a detachable magazine. The only downside is that you are forced to use a 10 round magazine in this configuration because of the "assault weapon" features. If a Mag Block Lock is in place, you can have several highly sought after features. A collapsible stock, a pistol grip, a forward vertical grip, and a flash hider are all allowed by law if magazine release is covered with a bullet button. While this may sound crazy to some, it’s a great way to have all the features you love and still be legal. Remember, never attempt to attach a magazine with a capacity over 10 rounds on a rifle equipped with these features and a bullet button. This would make the it an "assault rifle" which is heavily restricted in the state of California. Now let’s talk about another build that will allow you to keep your detachable magazine. Getting Around the Mag Block Lock and going "Featureless"
There is another way to get around the use of a bullet button. The way to do that is to create a "Featureless Rifle". The featureless build as it is known strips down the KEL TEC SUB-2000 rifle. These parts will need to be totally removed from the firearm; the collapsible stock, the vertical grip, and the flash hider. After these are removed a featureless grip will need to cover the existing pistol grip. It's a kydex slip on grip that will attach over the pistol grip preventing you from using it. After all these modifications are made, the rifle will be legal in California and you can use the detachable magazine. But always remember, adding a magazine that has over a 10-round capacity is a felony in the state and can land you some serious prison time. In order make these modifications, there are two routes you can take. Each of these methods of modification is legal and they will make the buying process much easier. Below we will break down the process so that it will be simple to understand. 1. Get the modifications done outside the state: Have a gunsmith or FFL licensed firearms dealer to make the modifications outside of the state. Then have them ship the rifle to an in-state FFL dealer. 2. Get the un-modified version shipped to a Class 7 FFL dealer in-state. Then allow the dealer to make the changes to the gun before picking it up. If you simply can’t wait to have a SUB 2000 modified, you can always buy one that has already been changed over. While you won’t get to customize the rifle the way you want it, the rifle will be ready to use. Also, you might have to pay more for a SUB-2000 that has already been professionally modified. If money is not an issue but time is, then this just might be your best option. In California your magazine capacity is restricted to only 10 rounds which is a total bummer for most gun owners. California Law prohibits the ownership of "high capacity magazines" which they define as "any ammunition feeding device with a capacity to accept more than 10 rounds." This "California Magazine Limit" applies to all firearms in California not just the SUB-2000. Click here for more information on "Assault Weapon" classifications in California. While the laws we discussed in the above article are currently the rule of the land, things can change. So always remember to check the state and federal gun laws before attempting to bring any firearm into the state. It’s better to be safe than sorry. Breaking a gun law in the state of California could end up costing your freedom. so how do you release the mag with action open?